Hi Deborah, oh how special your gift from Linda was. I love all the pretties she sent you and that gorgeous cup. She sent to me several exchanges ago so I know first hand how generous she is. Love the green cup and pretties you sent you your partner too. This has been such a fun exchange and Stephanie sure has blessed us all with all she does to pull this together and be the perfect hostess. So nice to catch up with you. I so enjoyed your posts from time in Colorado and meeting the sweet girls to coming to Texas too. I am so glad to have "met" you through Stephanie's teacup swap! 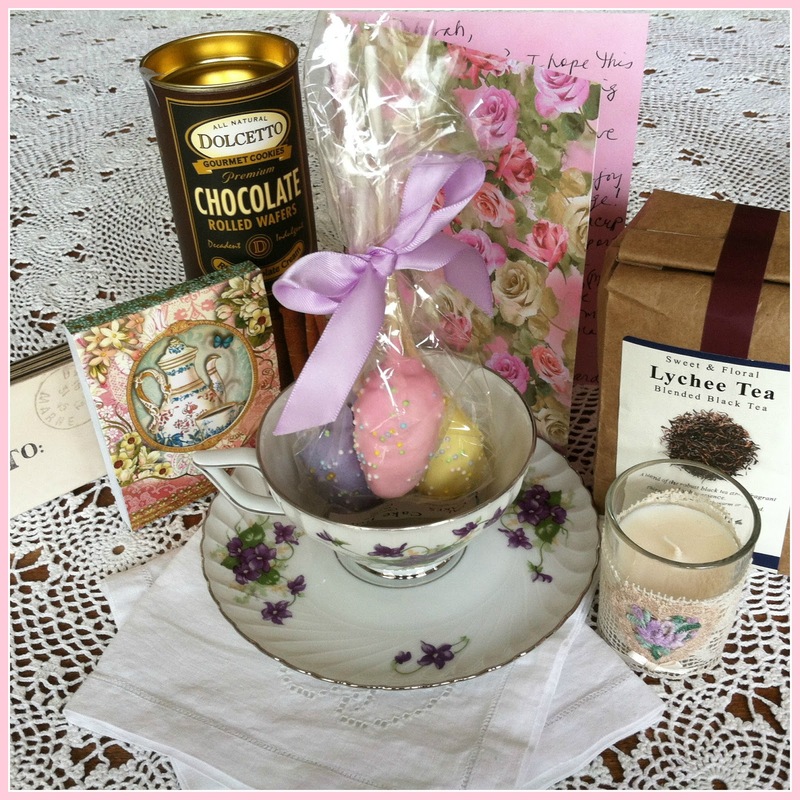 I'm also happy that you love your teacup and are enjoying the other goodies! Now if we could all get together with our new teacups and meet for tea.....that would just be the icing on the cake! 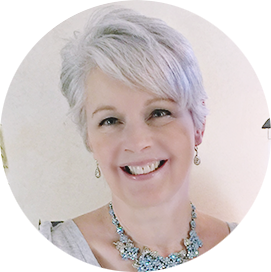 I am looking forward to reading more of your blog and getting to know more about you! It was so wonderful to see photos of you with the other lovely ladies that you were able to meet! Have a wonderful week! 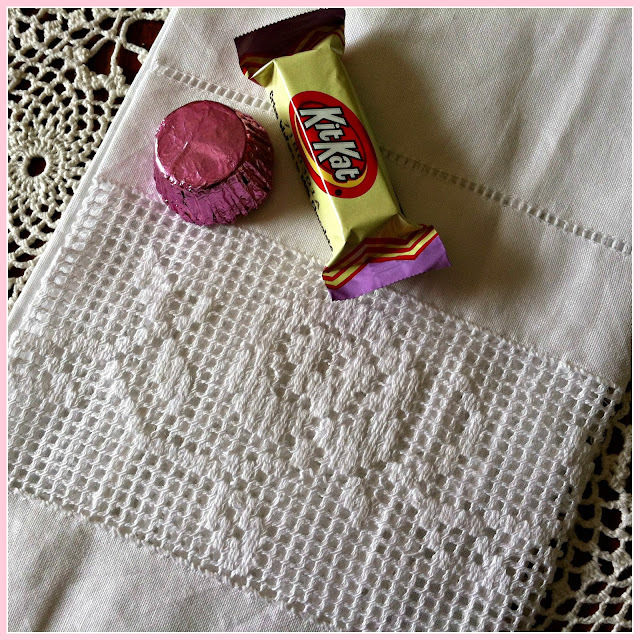 You certainly were spoiled by my friend, Linda, who I had the pleasure of sending to in the last exchange. I'm swooning over your teacup and it's pretty, vintage design, and all you extra goodies. Yes, the candle is so sweet..I'm stealing the idea, too!! Your heart shaped teacup is just so cute that you sent to Karren. 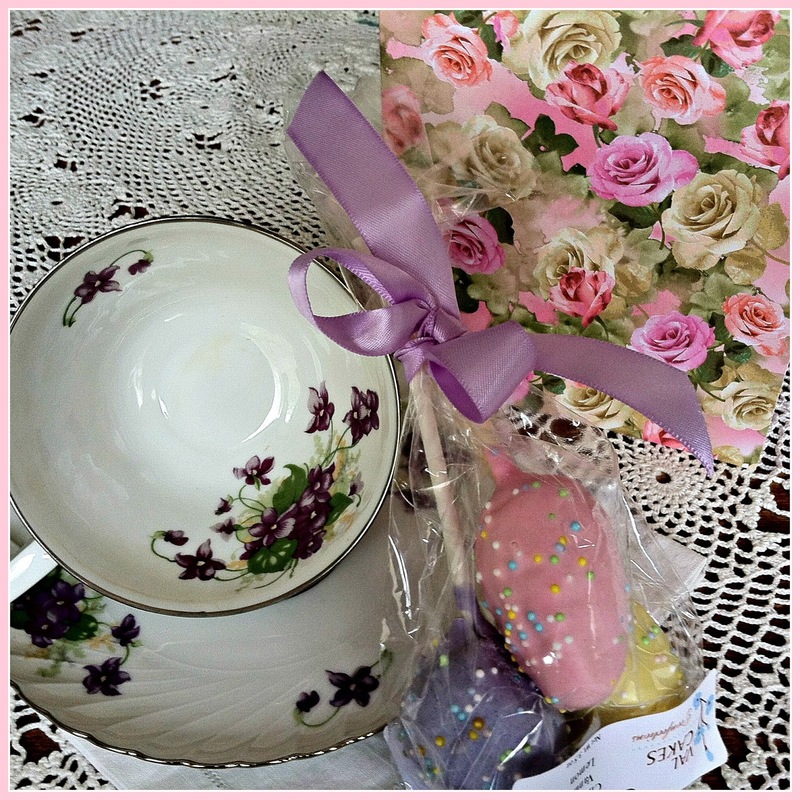 Who wouldn't smile at heart- shaped teacup, and other goodies?! Yes, Stephanie blesses us with this teacup exchange of giving from our hearts and receiving with such joy! Love and hugs and happy tea time, sweet friend, are sent to you. You were certainly blessed with some beautiful gifts. Such a wonderful exchange. Yes, you sure received a wonderful box of goodies. I especially love the little Punch Studio notepads - I think they are darling! Have fun! 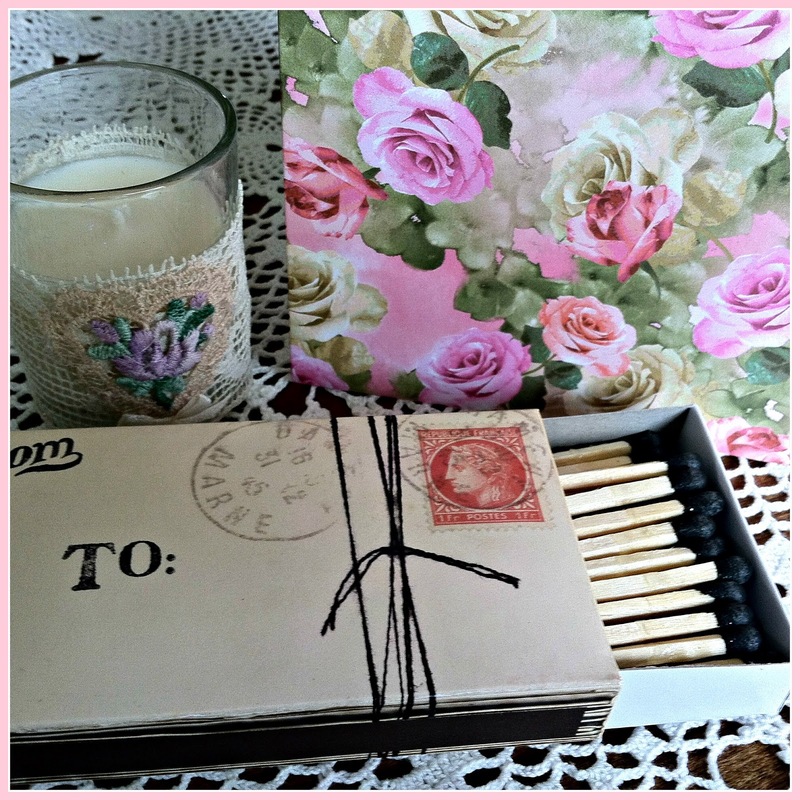 You received and gave some very lovely things, Deborah! That teacup is stunning and what a darling votive candle. I'd snap that idea up too! Isn't this so much fun? You were so spoilt by Linda and the collection you sent was lovely too. Sadly, due to work commitments I couldn't join the party this time! Wonderful treasures both coming and going, Deb - what fun...and the best part for sure is the friendships made. Stephanie sure knows how to pair us, does she not? 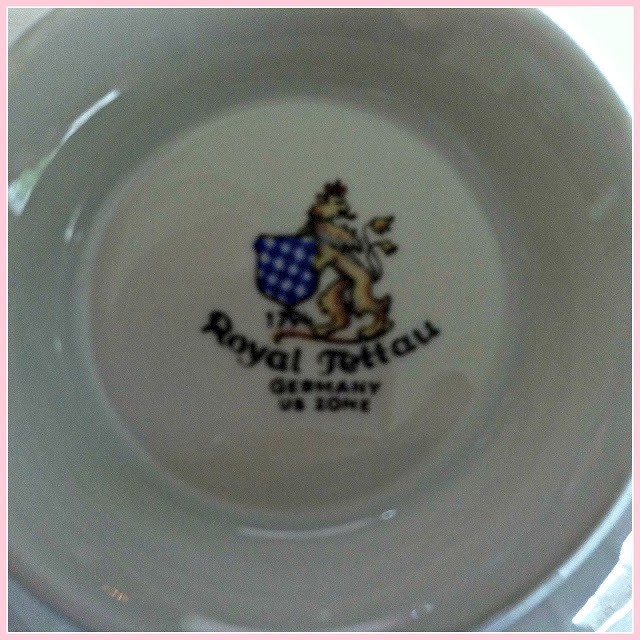 Deborah, you are one lucky girl ;) What a beautiful teacup you received from Linda. And all the extra little goodies are beautiful, and I know they are exactly the kind of thing you admire and enjoy. The heart-shaped teacup you sent out is so pretty too! I've not seen one of these before, and the colour green (my fav) is gorgeous! What a lovely package you put together. Enjoy your new tea & cup! What a lovely exchange! Your gifts and the ones you gave are sweet and given from your hearts. I'm loving the pretty teacup featuring purple flowers and iridescent finish! 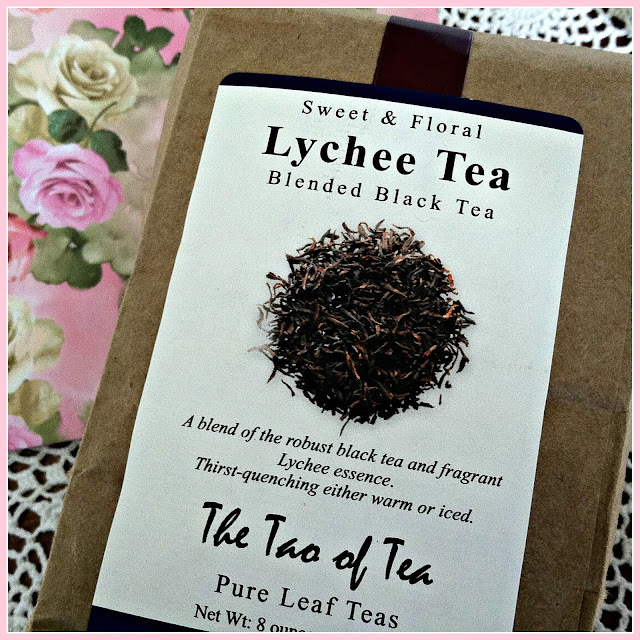 I'm also intrigued by the lychee tea--it sounds like it would make a refreshing iced tea during warmer weather. 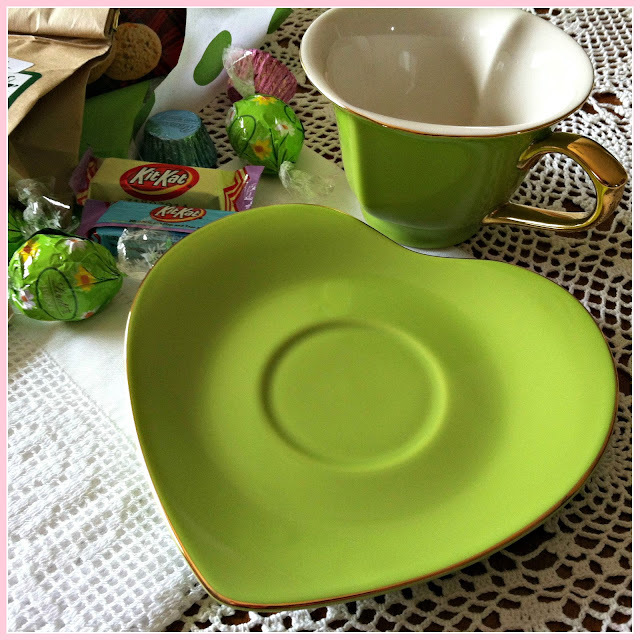 I'm also a fan of the green heart-shaped saucer that you sent to Karren. I like getting background info about our partners so that we can ensure that we send them items that they'll enjoy! Hi Deborah, you received such beautiful gifts - I love everything. You also sent out wonderful goodies. The green tea cup is quite interesting. Have a wonderful evening! 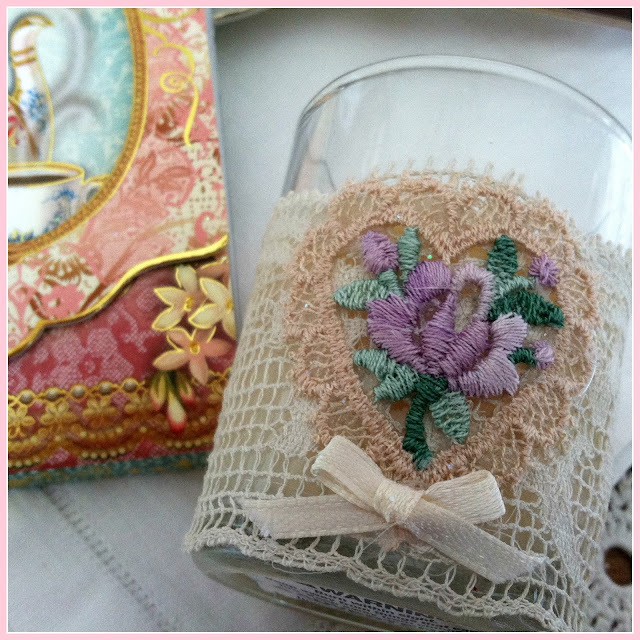 Such a pretty teacup with violets and other goodies Deborah. Oh Deborah...Linda is one of the most gracious ladies, and she has certainly blessed you with her beauty. I too have had the joy of receiving a teacup as well as some delightful gifts from her. She has a way of finding the most gorgeous teacups. You are going to enjoy getting to know her. I see you sent a gift to Karren, and that teacup is beautiful and quite fitting for her. I had the privilege of receiving my teacup from Karren this time around, and she certainly blessed my heart. Oh the beauty of these exchanges just amazes me. I have spent nearly all day visiting the ladies in this party and it has been a joy. You can see the love and grace poured out through every gift. 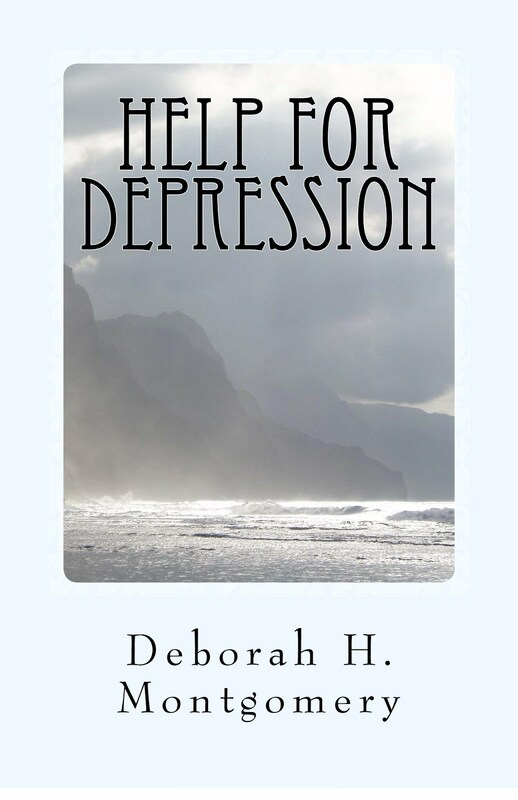 What a wonderful little exchange, Deborah, not only what you received, but what you sent. I'm most impressed with the fact that you dine by candlelight every night - that's quite special! I am not a tea drinker, per se, but I certainly can appreciate the ritual and all the niceties that go with it. Enjoy! Deborah, it's been ages since I've been by...or even visited in blogland. Life has been crazy, but I decided to take a few minutes today to visit my favorite blogs. I've missed everyone so much. Anyhow, a teacup exchange...such a lovely idea. What gracious gifts given by all. 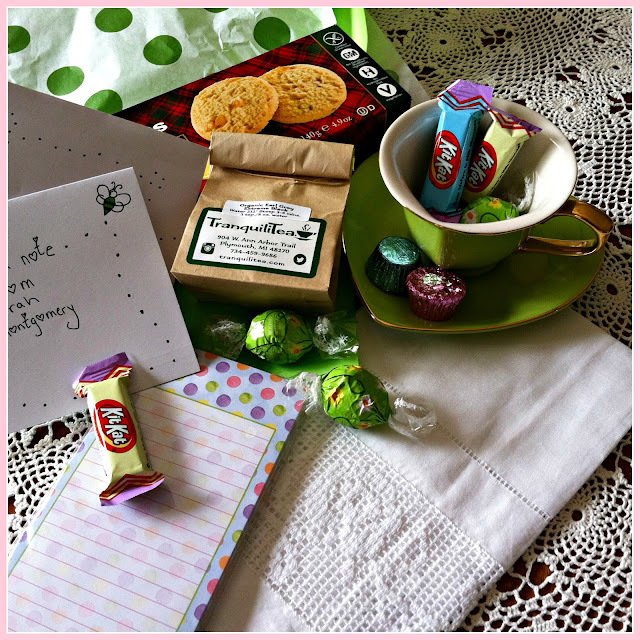 A beautiful teacup package you received and sent! This was so much fun! Oh Deborah, where do I even begin! Linda always picks out the most beautiful tea cups! The one she sent you is a beauty and I just LOVE the era it's from. And speaking of tea cups, the green heart one you sent to Karren is darling and so unique. Everything is simply lovely, my friend. It's truly an honor to have you participate in the exchange...thank you! Much love and sweet hugs to you! What a joy this is and it proves once again that there are so many nice and generous people out there! We all do not make the headlines on TV but by reading our blogs, it brings a lot of joy and reinstates that there is a lot of good in people. 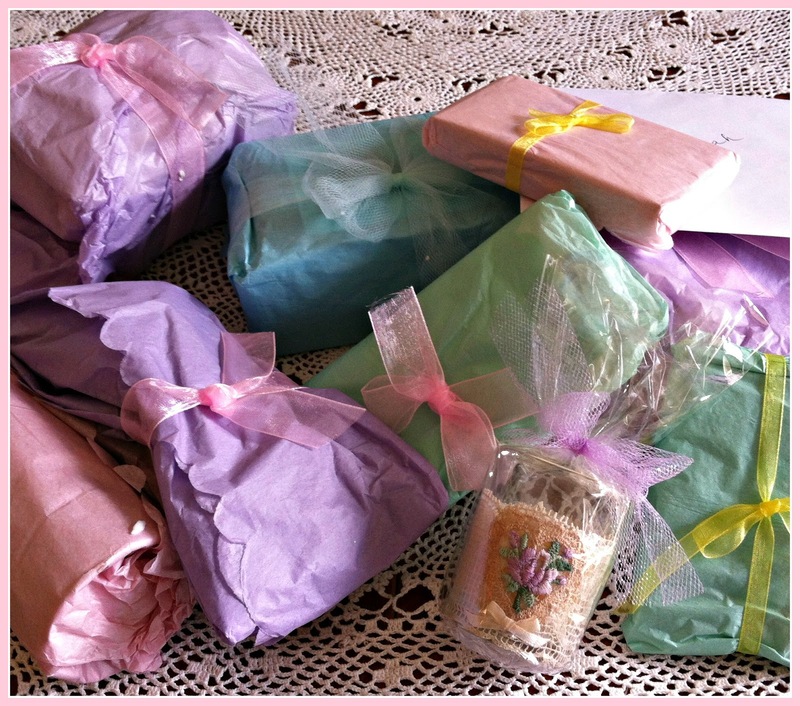 Thanks for showing us your lovely photos from gifts received and gifts sent. I'm not yet done scanning, got it down to ⅔ now. I know I could hardly wait to receive my parcel, and was overjoyed with what I was given. Such an uplifting feeling from such a small thing. I can hardly wait for the next one. You have a stunning blog, by the way. Enjoy your weekend! A parcel of treasures indeed! How lovely. It is so much fun to find real mail in one's post box. Thanks for giving us a glimpse of your lovely things.